Cheese glorious cheese. The food of the God’s in my opinion. I’ve had an obsession with cheese for as long as I could remember. I have it every single day and often more than once. In a game of what would you take to a desert island, I once said cheese- yes practicality aside. So let me tell you a little about Castello if you aren’t up to speed. Started in 1893 by master cheese maker Ramus Tholstrup who travelled the world trying different cheeses (my future career?). From this experience and what he learnt Castello was born. 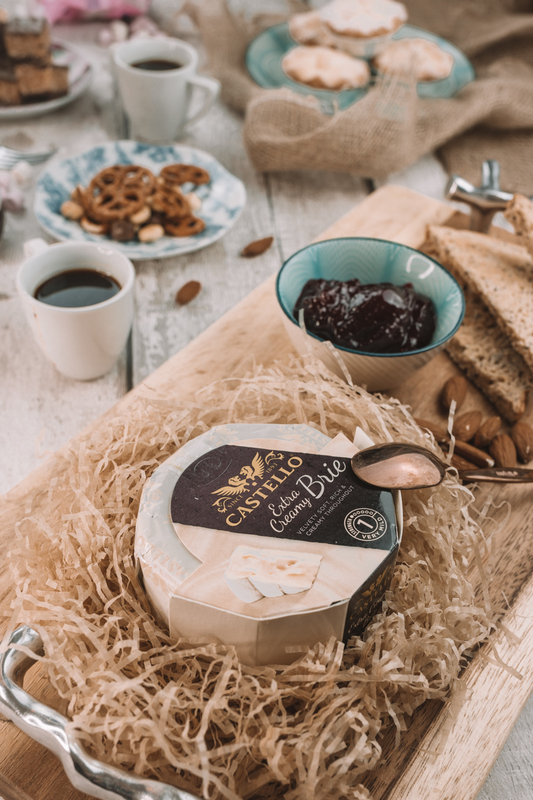 Today, Castello has created individual cheeses that come from the original recipes, using quality ingredients and intriguing flavours, but with a more modern and innovative approach, making them creatively crafted. 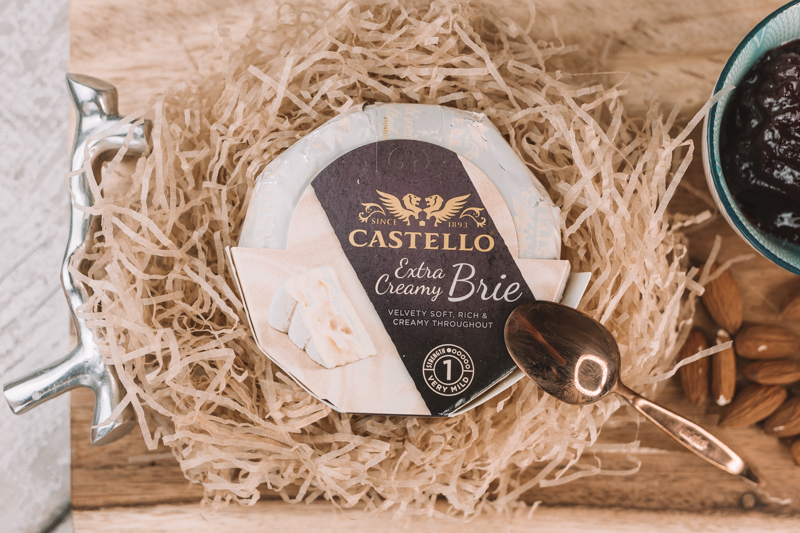 Now they have just launched the new Castello Extra Creamy Brie. A new approach to the good old classic. 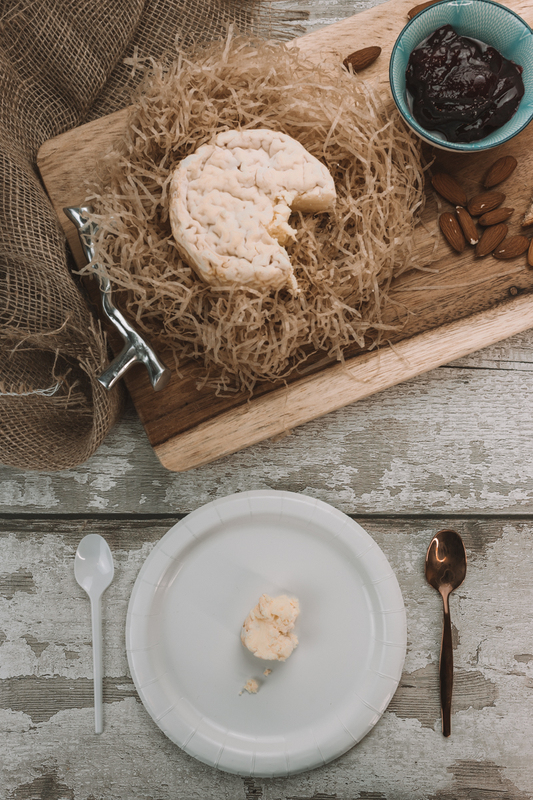 Being extra creamy, Castello almost has a buttery like texture and even after being in the fridge is very spreadable. It’s lovely and creamy, but incredibly soft and coats the mouth. Its rich, but the flavour is mellow enough that it doesn’t overpower as cheese can often do. 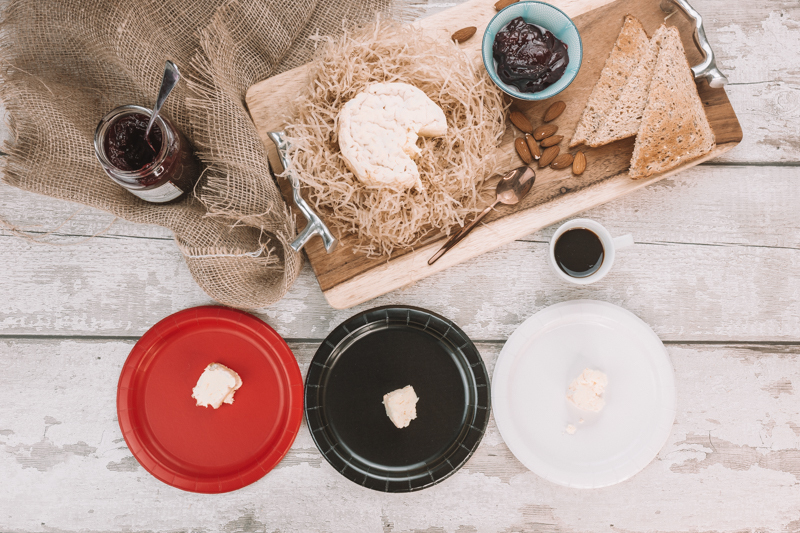 Brie for me has always been great spread across some crackers and maybe with a little chutney. Have you tried it with plum chutney by the way? It’s a winner. But, how I ate it, and in what environment, never had any input. 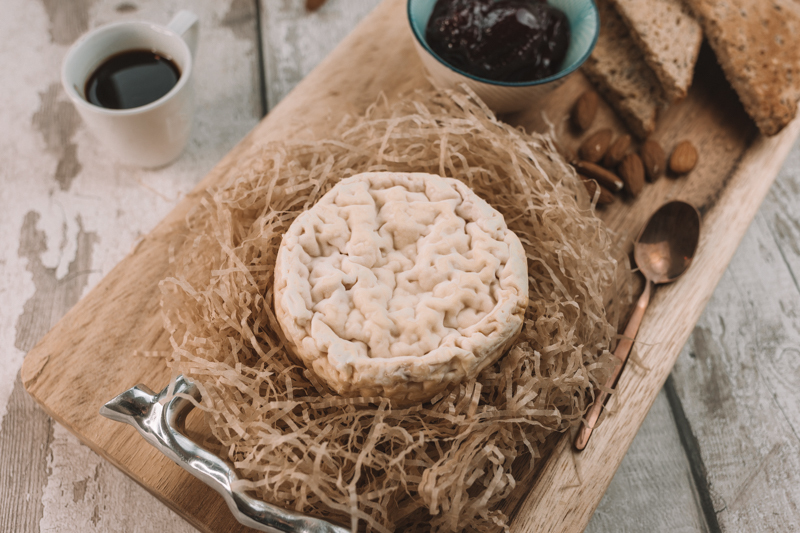 Yet the clever bods at Castello have teamed up with Creative Neuroscientist Katherine Templar Lewis, to delve into the world of creatively crafted Cheese and its effects on the senses. The science goes that your senses will change the way you taste things. Ok I don’t mean changing cheese into to chocolate (now that would be a neat trick), but subtle changes in taste. Touch, sound and colour changes affect your brain signals and affect your taste sensations. So in the name of science (and cheese) I gave it a go to see if science could be applied to an everyday girl. Science says that the weight, texture and colour of a spoon can affect taste. So I tried an equal cube sized amount of Castello eating from a white plastic spoon and a solid copper spoon. It was an interesting experience actually. The plastic spoon reminded me of eating cheese at a picnic whilst the copper spoon reminded me for of a fancy meal out and having a cheese course. I feel like the perception came from my association to memories. Usually eating a picnic is quite a casual affair and usually in my house thrown together last minute. Whilst having eaten at some fine French restaurants in my time, the cheese felt more expensive because of that memory. By expensive, I mean, that it had a much richer taste. It was stronger, but not in an overpowering, more in a way that I could taste the cream more and the subtle flavours stood out more. Colours all have associations for us. Red usual makes us think of danger, pink as feminine and blue is tranquil etc. Little fact of the day for you. Hospitals tend to be painted or have accessories of pastel/ mint green as that colour is supposed to have a calming effect. For this experiment, I was to place equal cubes on a red plate, a white plate and a black plate and see what the perceived taste was like from these. Again, my mind had memory associations with these colours; red for me means danger or anger. A meal from a red plate is usually something harsher, maybe more fiery, and so I felt like the cheese had more of a tang to it. I felt it was less creamy than when I had it before. Whereas the white tasted much more creamier than on the red plate. Again it reminded me of picnics as I spread it on my crackers, where the cheese being out of the fridge for a little while would always glide on easily. The black plate was strange. It almost seemed like it was firmer and it didn’t feel as rich an experience. Finally I was to play with my hearing sense. The science says that sounds at different tempo’s and tone affect our perception of creaminess. Then the second track I listened to was Tchaikovsky’s String Quartet No 1 in D Major. On their own it was quite hard to pinpoint taste details, unlike the previous experiment as having never listened to these tracks before; I had no memories to associate with. Comparing almost side by side, the first track, Mozart had a much higher pitch sound but has a more soft, romantic sound than Tchaikovsky’s. So by the association of soft, romantic sounds, the brie felt more smoother. But also Castello extra Creamy Brie just tastes amazing. Cheese by a winter fire anyone? This post was sponsored by Castello, but all views, words and images are my own.